UNITED NATIONS, June 8 -- Iran sanctions are slated to be voted on in the UN Security Council as early as June 9, but Turkey and Brazil have requested first the consideration of their nuclear deal with Tehran, which they say has not been considered. Turkey's Ambassador to the UN, emerging from the Council chamber late on June 7 told the Press that Iran, too, should be heard from before any sanctions vote. "Let them vent," a Western diplomat told Inner City Press, predicting the vote will proceed on June 9. Another Western Council member's spokesman said all the remained to be decided was the "choreography." He predicted that the resolution's annexes would imminently be finalized and "go blue," starting the 24 hour clock to a possible vote. But on June 8 from Tehran came the statement that the imposition of new sanctions will stop any negotiations. Analysts say that the sanctions proponents expected this. Their goal, the BBC propagated Tuesday morning, is to harm Iran's economy and undermine the regime of Mahmoud Ahmadinejad. Some wonder at the different approach taken to North Korea, which actually developed crude nuclear weapons, and according to South Korea sank its ship the Cheonan, killing 46 sailors aboard. Sanctions are not being sought against the regime of Kim Jong-Il, on the theory that it would only lead to worse and more bellicose behavior. So just as banks sue small debtors but cater to those owing $100 million dollars, the Security Council sanctions those who still negotiate while running scared of the real outlaw states. What message does it send? Inner City Press will be covering the June 8 Security Council action in real time, stay tuned. Update of 1:44 p.m. -- Emerging from the morning's UNSC consultations, US Ambassador Susan Rice said a "strong" resolution will be passed tomorrow. She did not respond when asked if non affirmative votes, presumably by Turkey, Brazil and perhaps Lebanon, would weaken the resolution. Sources say that the annexes contain, along with organizations, a lone individual, whose name is not yet known. There will be a "closed" debate, with non Council members, at 3 p.m., and for now a vote on the resolution at 10 a.m. tomorrow. Watch this site. Update of 4:49 p.m. -- the closed debate is over. Susan Rice took two questions, on whether the sanctions are binding. She called the financial aspects of the resolution "groundbreaking." But would they bar, for example, Chinese investment in Iran's energy industry? More informative was a self-described "Turkish diplomat," who said Turkey had been frustrated by how its and Brazil's deal with Tehran was treated by the Council. He was asked if the US is asking Turkey to abstain rather than vote no. This is diplomacy, he said. But could there be a trade off involving the US's position on the investigation of Israel's assault on the flotilla to Gaza? The Turkish diplomat said that when they voted for the flotilla resolution, it was there understanding it had to be a UN-led investigation, on the theory that no investigation by Israel -- "a party" -- could be impartial. The US' Alejandro Wolff that night said the US thought Israel would take the lead. Could Turkey's position on Iran sanction switch from opposition to abstention in exchange for US support for a UN-lead flotilla investigation? UNITED NATIONS, June 7, updated -- With the push on for the Security Council to adopt nuclear sanctions against Iran, Turkey and Brazil on Monday convened consultations to ask for a formal debate before the sanctions vote. Inner City Press asked if the request was for non-Council members, like Syria for example, to be able to speak. We'll tell you when we come out, more than one entrant said. One of these entrants came out at 5 p.m. and predicted to the Press that the Iran sanctions vote will be Wednesday. While Hillary Clinton is slated to speak about Iran with her Brazilian counterpart at the Organization of American States meeting in Peru, the proponents of the sanctions seemed resigned to non affirmative votes by Turkey, Brazil and perhaps Lebanon. Later it was announced that the Council will hold more consultations on Iran, this time on the resolution itself, on the morning of June 8. The resolution text is "in blue" but the annexes are not. While on the previous North Korea nuclear resolution, the annexes were left for the Sanctions Committee to do, that requires consensus which would be blocked in this instance by... Turkey, Brazil and perhaps Lebanon. Susan Rice emerged at 5:34 p.m., wouldn't confirm a Wednesday vote -- whatever everyone else wants, she said genially -- and ended with "this week." 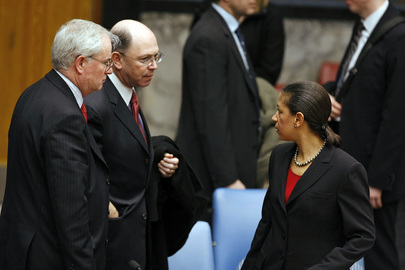 The US was represented for once by its two top diplomats, Susan Rice and Alejandro Wolff. Unlike all other Ambassadors they arrived with a security presence. Reporters lounged around in their designated pen, where they'd convened in the morning for a meeting on North Korea. On the sinking of the Cheonan ship, there's a request for another meeting. A self-described Western diplomat said that the Security Council will deal with the issue as deliberately as the "multinational" / South Korean investigators did. We will continue to live blog what's left of these consultations: watch this space. Update of 5:50 p.m. -- Council President Heller emerged, declined to go on camera, said that Tuesday a political discussion but definitely a vote "this week." Update of 6:27 p.m. -- Brazil's Ambassador came out. We want to have a political debate, she said. Tomorrow will be a "stage" in this process. Oh, the theatrics. Why do you want a debate, a reporter shouted out. Because so far it has been all technical. We do not want to debate just the resolution, but the wider context. Wednesday vote? She walked up the stairs. 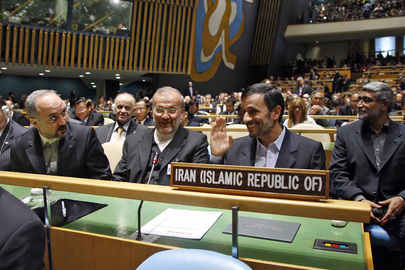 UNITED NATIONS, May 20 -- With the US-introduced Iran sanctions resolution now pending in the UN Security Council, some have wondered how and why it was introduced so quickly after Turkey and Brazil announced their deal with Mahmoud Ahmadinejad. 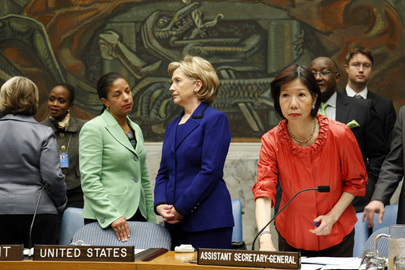 At the UN, US Ambassador Susan Rice convened a briefing for select press on May 18. Inner City Press is informed that this was supposed to be the US's launch of the resolution, its announcement of agreement with Russia and China. But forced by the Turkish and Brazilian deal with Iran, US Secretary of State Hillary Clinton jumped the gun earlier on May 18, testifying on Capitol Hill that the resolution would be distributed in the UN Security Council later that day. Susan Rice, thus scooped, merely read out the text of the resolution to the reporters selected by her and her spokesman Mark Kornblau. Later on May 18, after a Security Council session outside of which Brazil's Ambassador announced her country would not "engage" with the US draft, the text of the resolution was given to again select reporters at a reception at the Waldorf=Astoria. At that resolution, Rice's staff read over the shoulder as a story was being written, demanding to know how Rice and the resolution were being portrayed. The next day at an ostensibly off the record briefing by UK Ambassador Mark Lyell Grant, UK selected reporters were told that the agreement was reached Friday, with confirmation from capitals on Monday. But, other sources tell Inner City Press, France's Ambassador Gerard Fraud said during some Council members' trip to Kinsasha over the weekend that the P-5 plus one had agreed, and the resolution would be unveiled to in the Council to other members on Tuesday. Hillary Clinton and Susan Rice, who goes first on Iran? At a UN reception for Cameroon's 50th anniversary on May 20, the Permanent Representative of a major developing country scoffed at the resolution and its timing. "You will not stop Iran," he told Inner City Press. He said that "Saudi Arabia doesn't really want a bomb," and it is difficult for Egypt to come out and say Iran should not have a nuclear bomb if Israel has 200. Inner City Press asked if he thinks Brazil's Lula da Silva really wants to replaced Ban Ki-moon as Secretary General of the UN. No, he said, Lula is too big for the job. The Cameroonian music played. Footnote: at Cameroon's reception, France's Araud and the UK's Lyall Grant were in the house, along with a slew of other Ambassadors. The Permanent Representatives of the US and Russia were not seen, the latter having the UN excuse of a simultaneous screening of a film classic about Russia's win in World War II. The Ambassador of Cameroon cut the cake and then the rug: there was dancing. It was the most successful reception so far in the "interim" Delegates Dining Room, topping Senegal, but to Inner City Press an Ivorian diplomat vowed to go it one better. We'll see.